Samsung’s best and most recent smartwatch has been available at a small $50 discount multiple times since making its US commercial debut back in August, but bargain hunters know full well the manufacturer’s official e-store and third-party retailers like Best Buy are not the places to go to maximize their savings. Trusted eBay sellers like Quick Ship Electronics are a much better choice for price reductions as high as $110. Killer deals like that are rarely as good as they seem, but the $219.99 Samsung Galaxy Watch “bundle” up for grabs today truly comes with minimal risks and almost no significant compromises. The 42mm rose gold smartwatch on sale in a “limited quantity” is not brand new, which definitely sounds inconvenient, but to support the excellent working condition of these drastically marked-down devices, Quick Ship Electronics is offering a rare 1-year warranty at no extra charge. Also, free nationwide shipping, although returns are not accepted. Listed as a “new other” product, the Galaxy Watch will be shipped in “slightly distressed” packaging, which means the retail box has been opened either to display the Android and iOS-compatible smartwatch in a store or by an owner who had a change of heart, returning it before causing damage. 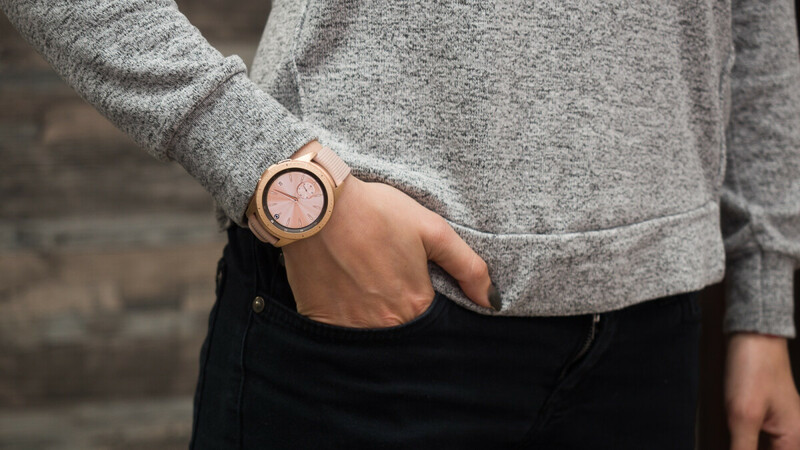 Made from stainless steel, with a silicone pink beige band matching the snazzy rose gold paint job of the watch case, the device should power on with its factory settings restored, including all original accessories, as well as an extra charging setup. At $219.99, it’s essentially impossible to argue with the quality/price ratio of the Samsung Galaxy Watch, which supports everything from NFC to GPS technology by itself while packing a powerful dual-core Exynos 9110 processor and sporting a beautiful 1.2-inch Super AMOLED screen with 360 x 360 resolution and a rotating bezel.